About meDedicated in 1979 by the Puerto Rican national poet and revolutionary leader Juan Antonio Corretjer, the Andrés Figueroa Cordero Library has become a source for many Chicago-area students researching the Puerto Rican reality. 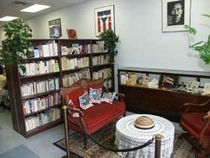 About my libraryThe Puerto Rican Cultural Center is founded on a philosophy of self-determination and a methodology of self-actualization. Following these ethics, we see the Andrés Figueroa Cordero Library and Community Information Center as a space in which individuals will have the resources to engage each other in self-conducted education. The capacity to practice responsible freedom, the ability to grow in personal consciousness and praxis, and the possibility of contributing to the development of society are fundamental. They can only be attained through the power of well-informed citizens to exercise their democratic rights and to play an active role in society. Constructive participation and the development of democracy depend on open access to knowledge, thought, culture and information. We envision the library as a place where people can learn about, and share with a broader community of people, the depth of Puerto Rican and Latina/o history, experiences, and struggles. We also visualize the library as a catalyst space, that is, a point of initiation that will contribute to and support an informed practice of community activism. In becoming a repository for the documented art, history, and experiences of the Puerto Rican community (with a focus on Puerto Ricans in Chicago), we expect that the library will educate people about the historical and cultural beginnings of Paseo Boricua, as well as possibilities for its future as a Puerto Rican space. In practical terms, we envision that young people and learners of all ages will claim the library as their place to study, to learn about the world, and to begin to imagine their active place within that world. We expect to develop within our community of learners a sense of self-worth and the ability to learn. We will address the growing gap in information technology access and use, and we will teach ourselves how to be part of a community going global around collections and information processes. We want the library to provide to the community at large access to information, technology services, historical collections, and educational and cultural programs. We anticipate that this access will act to broaden peoples’ definition and perception of what it means to be Puerto Rican. Detailed instructions on using our library, including explanations of our shelf layout and classification system, are available on-site for all visitors.